Advantage Chiropractic now offers Powerstep a revolutionary custom-molding technology — orthotics in-office in minutes! ProTech Light Orthotics™ revolutionizes the customization and comfort of orthotics by utilizing lightweight, light-curing composite materials that mold directly to a patient’s foot — in just minutes. This technology offers the most advanced orthotic plate in orthotics today, allowing practitioners to provide immediate relief to their patients in only one office visit. 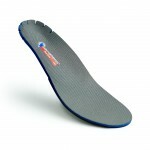 ProTech Light Orthotics have the most advanced composite design of any orthotics available. Unique UV light-cured resin with cross-linked fibers conform and mold to the foot. Revolutionary technology enables the most precise fit possible, transforming a flexible material into a shaped orthotic device using a light-curing process — truly unique to ProTech Light Orthotics. Thin, advanced composite support shell helps reduce the overall weight. ProTech Light Orthotics are generally up to 50% lighter than traditional custom othotics. ProTech Light Orthotics include a textile-lined open-cellular PU top foam to improve breathability, unlike most custom orthotics using closed-cell foams. Powerstep® is the #1 Podiatrist Recommended Orthotics Brand. Read the research summaries below to learn about using prefabricated orthotics for plantar fasciitis and other foot conditions, and how Powerstep® helps reduce foot pain. Powerstep® improves working conditions for employees. Wearing Powerstep® improves length of time standing, distance walked and ability to perform specific tasks on the job. Overall pain levels in employees with Plantar Fasciitis reduced steadily with each year of wear. Powerstep inserts reduced chronic pain in workers with Plantar Fasciitis when added to work boots or shoes, regardless of type and amount of work performed. Orthotics incorporating a rigid, plastic component are superior in reducing pain associated with Plantar Fasciitis and are quicker to alleviate pain. Thin, non-supportive orthotics do not have any effect on Plantar Fasciitis pain. Semi-rigid orthotics have moderate to large benefits in treating and preventing Plantar Fasciitis. Both soft, supportive foam orthotics and foam-covered rigid self-supporting plastic orthotics have a significant effect on pain levels; however, foam covered rigid self-supporting plastic orthotics are superior in pain reduction and quicker in pain free time. Foot orthotics are effective in treating ankle instability. There is significant evidence that foot orthotics address mechanical and functional instability of the ankle. Foot orthotics have the potential to enhance sensory feedback for improvement of balance and postural control. Foot orthotics could address the mechanical components of ankle stability by reducing strain around the soft tissue structures of the ankle and enhancing muscular strength for stability. Some studies show impressive improvements in balance when combining a prefabricated device with medial posting. Researchers attribute positive results with foot orthotics improving postural control to the fact that they optimize positioning of the foot. Efforts to reduce pronation of the foot are more successful in improving ankle instability than strategies that prevent supination or inversion. Foot orthoses may enhance balance and proprioception by stimulating the sensors on the plantar surface of the foot. Ready to purchase your Powerstep orthotics for plantar fasciitis or other foot conditions? Make an appointment to get your custom orthotics. You can go home with them the same day.